There are many reasons to visit Coney Island during the summer and even in the middle of the winter, but one spectacular reason to visit in the summer months is to watch the fireworks. Truthfully, what could be better than watching fireworks at one of America's beloved beaches? The Atlantic Ocean, the Coney Island boardwalk and amusement park rides, summer breezes--and fireworks! All for the price of a subway ride. But, when are they? Luckily you have many chances to see the fireworks throughout the summer months. Fireworks generally start the last weekend in June and conclude the Friday before Labor Day. Some of the following are weekend days, but others are during the week! The best place to see the Fireworks? You get a spectacular view of the fireworks from most seats at MCU Stadium. For the best non-stadium seating, head toward boardwalk or beach between West 10th Street and West 15th Street. Bring a blanket and get a spot on the beach where you can watch the glistening show or view the fireworks on the boardwalk. After or before you've seen the show, enjoy a drink at the iconic Ruby's bar, where you can actually drink underneath the boardwalk. A portion of Ruby's ceiling was created from the original 1920's boardwalk. Fireworks on the Coney Island Beach Fireworks shoot off at 9:30pm-10:45 every Friday night during the season, starting the last weekend in June and conclude the Friday before Labor Day. Fireworks are also played on the first home game for the Brooklyn Cyclones, and after other games as well. If you're heading to a seaside baseball game at MCU park, pick a date that offers a postgame fireworks show. For more information on the current season and postgame fireworks celebrations, check out the Brooklyn Cyclones website. The fireworks are provided by two different organizations. One, of course, is Brooklyn's very own Cyclones baseball team and MCU Stadium. The other sponsoring entity is the Alliance for Coney Island and the New York City Department of Parks and Recreation. The latter sponsors Friday night fireworks. One day where everyone expects to see a fireworks display is the Fourth of July. This is also one of the most popular days in Coney Island. Start your day watching the annual Nathan's Hot Dog Eating Competition, enjoy the rides at Luna Park and take in one of the best beachside displays. This will be a day to remember, as you retell the story of heading to see one of the most acclaimed events in competitive eating. Best part? The day is one of the most economical. From free entertainment at the Nathan's Hot Dog contest to a free fireworks display and free access to the beach, you will have one of the most budget-friendly holidays. Maybe fireworks aren't your thing, that's okay, there are still a plethora of other reasons to visit Coney Island. Instead of taking a scuba trip to see underneath the water and the world deep within the ocean, travel to the New York Aquarium, which is located in the heart of Coney Island, where you explore the shark tank (No, Mr. Wonderful isn't there). Or if you just want to score some of the best pizza in Brooklyn, head to the historic Totonno's. Coney Island is also home to a new Ford Amphitheater which has a popular summer concert series. 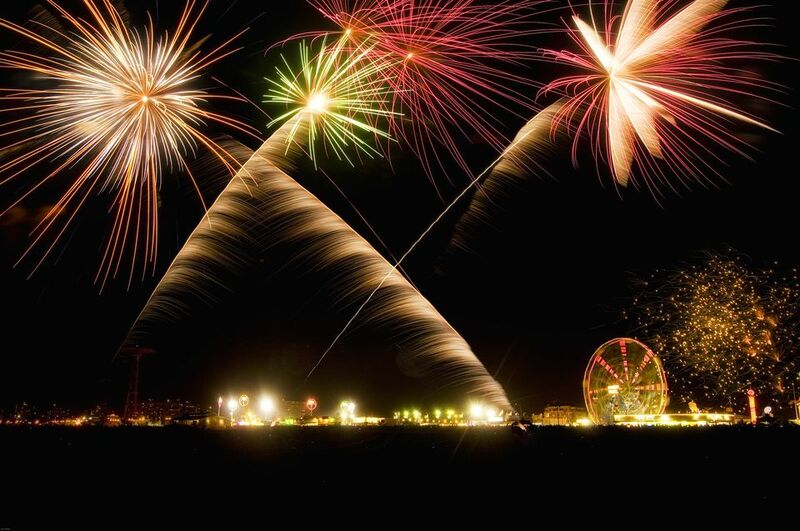 ​Fans of fireworks must make a trip to see this free summertime favorite in Coney Island, and enjoy a day at this iconic beach.